On Saturday, June 14, Troop 50 celebrated Flag Day by joining with the brave men and women of Auburn's Veterans of Foreign Wars Post 5404 who have served our country honorably to retire many U.S. and Alabama flags that have flown proudly over our country and state. The troop participated in the event at the invitation of Post Commander Ron Douglass. First proclaimed by President Woodrow Wilson in 1916 and established by an Act of Congress in 1949, Flag Day is celebrated annually on June 14. It commemorates the adoption of the flag of the United States on that day in 1777 by resolution of the Second Continental Congress. VFW Post 5404 coordinated the event, which included VFW dignitaries and members of the post's Ladies Auxiliary. The VFW, which traces its roots back to veterans of the Spanish-American War (1898) and the Philippine Insurrection (1899-1902), is the official nonprofit service organization for U.S. military veterans benefits, VFW programs, community service, patriotic and world events, American flag sales, and services to military veterans and communities. added to the VFW Post's flagpole area. Before the flag-retirement ceremony began, troop members assisted the post by enhancing its flagpole area and refreshing the rock bed at the base of the flagpole. Troop members also assisted with ceremony arrangements such as assisting with logistics and helping to fold the more than 100 American, Alabama, and POW flags that would be retired during the ceremony. tattered U.S. flag to be retired as part of the ceremony. senior vice commander as the first flag to be retired during the event. event to pay their respects to the U.S. flag. Troop 50 Scouts formed the flag-retirement honor guard and lowered, folded and presented the flags to post members for formal retirement. The two flags preceded the more than 100 other flags that were retired by post members, visitors, and Scouts throughout the afternoon. Those present also enjoyed fellowship over lunch prepared by post members. The post also celebrated the U.S. Army's birthday, which coincides with Flag Day. On June 14, 1775, Congress adopted "the American continental army" after reaching a consensus position in the Committee of the Whole. coming off the trail for a break. Many of those attending the flag ceremony headed out to Chewacla State Park after the event concluded to enjoy the beautiful afternoon and the network of biking trails developed in conjunction with the Central Alabama Mountain Pedalers, or C.A.M.P., organization. Bikers started on a one-mile loop to allow everyone to get comfortable on their bikes before venturing further into the park. After mastering the bike loop, the group headed over to the Falls View Trail where the ride was much more challenging, as well as the CCC Camp Trail near the park's CCC Campsite that Troop 50 and other Scouting troops frequent for district events and local campouts. In the past, several of our Scouts assisted with creating and maintaining these trails as part of a service project at a previous Saugahatchee District Camporee. Of the four designated mountain bike trails, the troop covered most of two of them (Trails #1 and #2). After about an hour and a half of peddling through the woods, the boys decided to hang up their helmets and call it a day. Everyone made it back safely, however, there were several stories of Scouts being introduced to a tree or the ground in an intimate way. All Scouts enjoyed telling their trail stories and seemed eager to do it again! Learn more about the C.A.M.P. 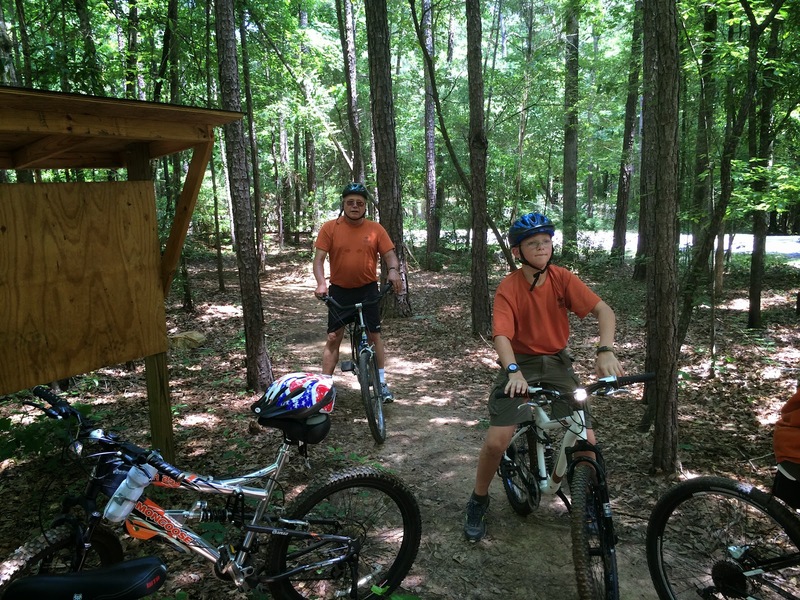 mountain-biking trails at Chewacla State Park by visiting the C.A.M.P. website. 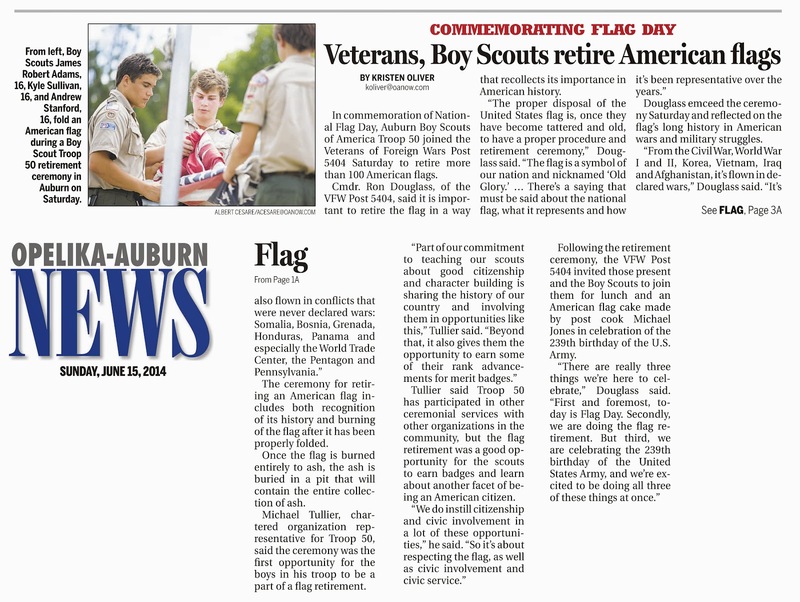 The troop's involvement in the VFW Post 5404 flag-retirement ceremony was featured in the Sunday, June 15 edition of The Opelika-Auburn News (view the online version). 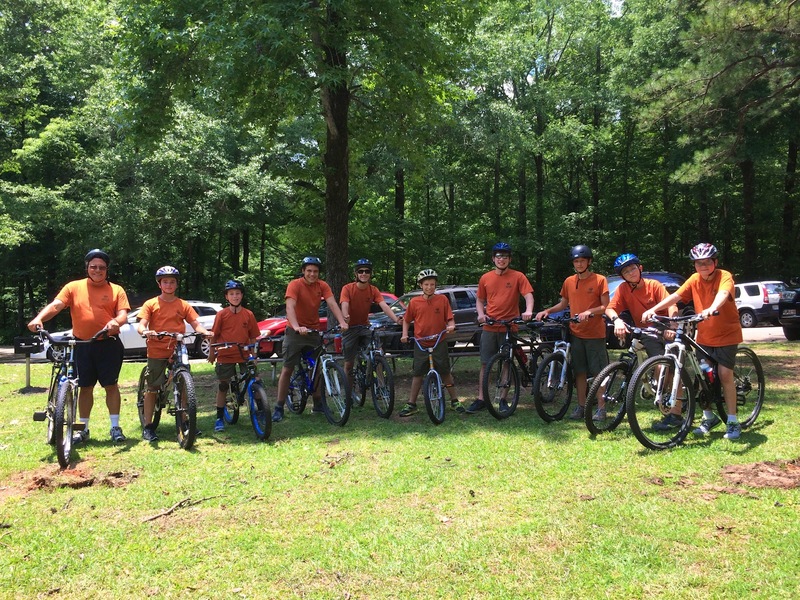 View additional photos from the VFW flag-retirement ceremony and Chewacla State Park mountain-biking outing on the troop's online photo album.